Wikimedians of Latvia User Group is an active user group representing all Wikimedians in Latvia. Collaborate with other Wikimedia user groups and chapters, other free culture groups in Latvia. Currently there is no formalized structure of the group, membership is open. To join the group, add your name to the list and use provided means of communication. Members of group who have been actively involved in organizing or participating in groups offline efforts during the last year. 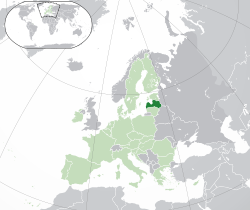 In October 2012 Latvian Wikipedians submitted initiative to change Freedom of Panorama restrictions in Latvia. To be reviewed in Parliament, the initiative has to gather 10,000 signatures. It is possible to do so in electronic form, using an officially recognized website, run by NGO. The initiative is still in vote gathering phase. This page was last edited on 15 April 2019, at 19:03.